The famous Tiffany dragonfly lampshade originally designed by Clara Driscoll in 1900. Fine selection of reproduction hand manufactured stained glass Tiffany table lamps including the famous Lilly, Wisteria, Mackintosh and floral designs. 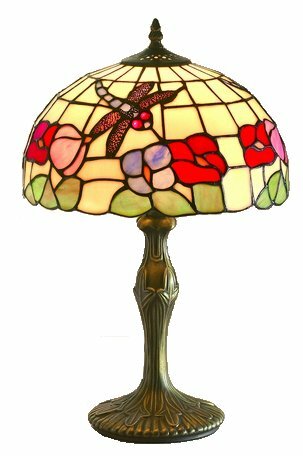 12 Inch floral Tiffany Table Lamp with Dragonfly motif. Requires 1x60w BC bulb (not supplied), approx dimensions are height 52cm (20 inches), shade diameter 30cm (12 inches). 8 Inch floral Tiffany Table Lamp with Dragonfly motif. Requires 1x60w BC bulb (not supplied), approx dimensions are height 41cm (16 inches), shade diameter 20cm (8 inches). 15 Inch floral Tiffany Table Lamp with Dragonfly motif. Requires 1x60w BC bulb (not supplied), approx dimensions are height 66cm (26 inches), shade diameter 37cm (15 inches). PLEASE NOTE: delivery is four days for this item. Making a Purchase could not be easier. Search through our range of lamps. Click on any items you want to buy, and put them in the shopping cart by clicking on the 'Buy Now' button. When your ready to pay simply click on the Shopping Cart button and you will be asked for your delivery and payment details, we accept Cheques, Credit and Debit cards and Paypal. All lamps are handmade using stained glass, and therefore no two lamps will be identical. There may be slight variation in the marbling of the glass, or the hue. Floor and Table lamps come with a fused plug and in-line push button switch, floor lamps are provided with a floor switch. Light bulbs are not provided and bulb specification may change, light fitting are able however to take energy saving bulbs.